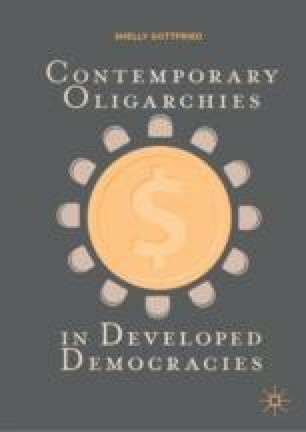 This chapter focuses on the definitive stage in the formation of an oligarchy: the financialization of the economy beginning in the late 1990s and the early 2000s. The ‘coming of age’ of modern oligarchies and the resulting market concentration were accelerated by the financialization, which originated in the liberalization of the capital markets. This reform process served to transform big business groups into oligarchic structures, often utilizing a pyramidal structure of ownership and control merging between financial and real holdings. This was twinned with extensive influence on decision-making. The chapter analyzes the financialization in the global economy through a closer examination of an illustrative case study—Israel. The way financialization was implemented in Israel is indicative of similar processes in other states, where paradigms of free and competitive market converted into a process generating a concentrated power structure with vast control over the political economy as a whole. Amir, M. (2012, September 4). Expert Opinion—The Lawsuit Against Discount Investments Corporation for Its Investment in Maariv [Hebrew] [Online]. Available: http://www.google.co.il/url?sa=t&rct=j&q=&esrc=s&source=web&cd=5&ved=0CEEQFjAE&url=http%3A%2F%2Fmeiramir.co.il%2F%3Fdl_id%3D6&ei=yNE6U8T9B8va0QWjhYGYAg&usg=AFQjCNEoRWOyQpSqkEEPD9-zndXBEOqpjw&bvm=bv.63934634,d.d2k. Accessed 30 June 2013. Appelberg, S. (2014a, July 30). Kabub Enabled to Review the Loan Documents from Hapoalim to Dankner [Hebrew]. TheMarker [Online]. Available: http://www.themarker.com/markets/1.2392813. Accessed 14 September 2014. Appelberg, S. (2014b, August 5). Hapoalim Bank Tries to Prevent the Exposure of the Documents Which Have Led to the Loans to Nochi Dankner [Hebrew]. TheMarker [Online]. Available: http://www.themarker.com/markets/1.2397531. Accessed 14 September 2014. Arlosoroff, M. (2013, April 22). Amateurness in the Banks’ Closed Rooms [Hebrew]. TheMarker [Online]. Available: http://www.themarker.com/markets/1.2000226. Accessed 14 September 2014. Avriel, E. (2014, December 1). The Israeli Banks Present: This Is How Crony Banking Works [Hebrew]. TheMarker [Online]. Available: http://www.themarker.com/markets/1.2214277. Accessed 20 February 2015. BDI Coface. (2007). Information on Business Companies. Available: https://www.bdi.co.il/default.aspx. Accessed 5 May 2013. Boyreau-Debray, G. (2003). Financial Intermediation and Growth: Chinese Style. World Bank [Online]. Available: https://openknowledge.worldbank.org/handle/10986/18229. Accessed 4 December 2014. Cho, D. (2009, August 28). Banks ‘Too Big to Fail’ Have Grown Even Bigger. The Washington Post [Online]. Available: http://morningbull.blog.tdg.ch/media/00/00/1067033021.pdf. Accessed 3 January 2015. Ginzburg, A., & Rochvarger, M. (2013, December 9). You Bought IDB Bonds After the Collapse? You Earned [Hebrew]. TheMarker. Available: http://www.themarker.com/markets/1.2185380. Accessed 27 July 2014. Guriev, S., & Rachinsky, A. (2004). Ownership Concentration in Russian Industry (Background Paper for the World Bank’s Country Economic Memorandum for the Russian Federation). Available: http://www.cefir.org. Accessed 2 December 2014. Haran, M., & Weinberger, G. (2012). The Bachar Committee—Examination of the Status of Implementing Recommendations and the Current Capital Market [Hebrew]. The Milken Institute. Available: http://www.mifellows.org/research/HEB_F/69-HB-F.pdf. Accessed 12 August 2013. Hodak. (2010). The 2009 Hodak Committee to Determine Parameters for Consideration by Institutional Investors When Investing in Non-Governmental Israeli Debt Securities [Hebrew]. Available: http://www.tavor.biz/files/final_conclusions_hodak_committee.pdf. Accessed 15 March 2015.
International Monetary Fund. (2006). Israel: Selected Issues (IMF Country Report, No. 06/121). Available: http://www.imf.org/external/pubs/ft/scr/2006/cr06121.pdf. Accessed 15 June 2014.
International Monetary Fund. (2012). Israel: Financial System Stability Assessment (IMF Country Report, No. 12/69). Available: http://www.imf.org/external/pubs/ft/scr/2012/cr1269.pdf. Accessed 13 June 2014. Israel Knesset. (2005). The Capital Market Reform—Full Legislation [Hebrew]. Available: http://ozar.mof.gov.il/bachar/asp/reformreport.asp. Accessed 11 June 2014. Israel Knesset Research and Information Center. (2012). Describing and Analyzing Interest Rate Intervals and Discrepancies in Israel and in Other Developed States [Hebrew]. Available: http://www.google.co.il/url?sa=t&rct=j&q=&esrc=s&source=web&cd=1&ved=0CB4QFjAAahUKEwj52o6lg_GAhWFaT4KHYJdC0E&url=http%3A%2F%2Fwww.knesset.gov.il%2Fmmm%2Fdata%2Fpdf%2Fm03034.pdf&ei=-LKvVfn-K4XTQGCu62IBA&usg=AFQjCNG0LpEAbohwevhtQEvkdYl4iNeMHw&sig2=dTtXuujPu6H4r72HQeIOWQ&bvm=bv.98197061,d.ZGU. Accessed 2 May 2014. Israel Ministry of Finance. (2005). The Bachar Reform: Structural Reform in the Capital Market—Inter-Ministerial Committee Report. Available: http://ozar.mof.gov.il/bachar/asp/reformreport.asp. Accessed 5 November 2014. Israel Ministry of Finance. (2008). Regulations to Supervise Financial Services (Provident Funds) [Hebrew]. Available: http://ozar.mof.gov.il/hon/2001/gemel/memos/niyud02.pdf. Accessed 2 May 2014. Israel Ministry of Finance. (2011). The Committee to Increase Competition in the Market—Interim Recommendations [Hebrew]. Available: http://mof.gov.il/Committees/CompetitivenessCommittee/TyuyatRec_Report.pdf. Accessed 12 June 2014. Israel Ministry of Finance. (2012). The Committee to Increase Competition in the Market [Hebrew]. Available: http://mof.gov.il/Committees/PreviouslyCommittees/Pages/CompetitivenessCommittee.aspx. Accessed 12 June 2014. Israel Ministry of Finance, Capital Markets, Insurance and Savings Division. (2005). Annual Report [Hebrew]. Available: http://ozar.mof.gov.il/hon/2001/general/rep_05.asp. Accessed 2 May 2013. Israel Ministry of Finance, Capital Markets, Insurance and Savings Division. (2013). Framework to Analyze the Portfolio of Institutional Investors in Israel [Hebrew]. Available: http://ozar.mof.gov.il/hon/2001/hon_dep/memos/TikNechasim.pdf. Accessed 2 May 2014. Israel Securities Authority. (2007). Financial Instruments Team—Interim Conclusions [Hebrew]. Available: http://www.isa.gov.il/Download/IsaFile_2466.pdf. Accessed 3 May 2014. Israel State Comptroller and Ombudsmen. (2013). Annual Report 64A [Hebrew]. Available: http://www.mevaker.gov.il/he/Reports/Pages/113.aspx. Accessed 3 May 2014. Johnson, S. (2009). The Quiet Coup. The Atlantic, 52. Available: http://www.theatlantic.com/magazine/archive/2009/05/the-quiet-coup/307364/. Accessed 24 January 2012. Kosenko, K. (2013, June 30). The Nature of Organizational Hybrids: Exploring the Evolutionary Dynamics of Israeli Business Groups, 1995–2008. SSRN. Available: http://papers.ssrn.com/sol3/papers.cfm?abstract_id=2287530. Accessed 29 September 2014. Nevo (Legal Database). (2003). The Law for the Plan to Recover Israel’s Economy, 2003 [Hebrew]. Available: http://www.google.co.il/url?sa=t&rct=j&q=&esrc=s&source=web&cd=1&ved=0CB8QFjAA&url=http%3A%2F%2Fwww.nevo.co.il%2Flaw_word%2FLaw01%2F999_256.doc&ei=xV7jU9K9KpLQ7AaYhoCYBg&usg=AFQjCNGW-QaokNxuZaoUJolBqKwBQFOtHQ&bvm=bv.72676100,d.ZWU. Accessed 5 May 2014. Nevo (Legal Database). (2005). The Law to Increase Competition and Reduce Concentration and Conflict of Interest in the Capital Market in Israel, 2005 Correction [Hebrew]. Available: http://www.nevo.co.il/law_html/Law01/999_467.htm. Accessed 5 May 2014. Nevo (Legal Database). (2009). Regulation File for Supervising Financial Services [Hebrew]. Available: http://www.nevo.co.il/Law_word/law06/tak-6793.pdf. Accessed 5 May 2014. OECD. (2011). Corporate Governance in Israel. Available: http://www.oecd-ilibrary.org/governance/corporate-governance-in-israel-2011_9789264097698-en;jsessionid=6k5f0of3q5nlg.x-oecd-live-02. Accessed 5 May 2014. OECD. (2013). Entrepreneurship at a Glance. Available: http://www.oecd-ilibrary.org/industry-and-services/entrepreneurship-at-a-glance-2013_entrepreneur_aag-2013-en. Accessed 5 May 2014. Porath, Y., & Steinberg, N. (2011). Chasing Their Tails: Inflow Momentum and Yield Chasing Among Provident Fund Investors in Israel (Bank of Israel, Discussion Paper No. 2011.07). Available: http://www.bankisrael.org.il/deptdata/mehkar/papers/dp1107e.pdf. Accessed 24 March 2014. Raz, H. (2013, June 25). So Did Discount Investments Corporation Burned Hundreds of ILS Millions in Maariv Transactions—While the Directors Kept It Quiet [Hebrew]. TheMarker. Available: http://www.themarker.com/markets/1.2054503. Accessed 25 September 2013. Schwartz, E. (2010). Management Fees in Provident Funds and Pension Funds. Knesset Research and Information Center. Available: http://knesset.gov.il/mmm/data/pdf/m02439.pdf. Accessed 22 May 2013. Sokolinski, S. (2012). Business Groups in Israel: Development, Diversification, and External Finance. Milken Institute. Available: http://www.milkeninstitute.org/publications/view/533. Accessed 2 December 2014. The Bank of Israel. Financial Stability Report 2003 [Hebrew]. Available: http://www.boi.org.il/en/newsandpublications/regularpublications/pages/2003_stab03e.aspx. Accessed 12 June 2014. The Bank of Israel. 2006 Annual Review [Hebrew]. Available: http://www.boi.org.il/he/newsandpublications/regularpublications/pages/skira06_skira06h.aspx. Accessed 11 June 2014. The Bank of Israel. 2009 Annual Review [Hebrew]. Available: http://www.boi.org.il/he/NewsAndPublications/RegularPublications/Pages/heb_doch09h.aspx. Accessed 11 June 2014. The Bank of Israel. 2010 Annual Review [Hebrew]. Available: http://www.boi.org.il/he/NewsAndPublications/RegularPublications/Pages/heb_doch10h.aspx. Accessed 12 June 2014. The Bank of Israel. 2011 Annual Review [Hebrew]. Available: http://www.boi.org.il/he/NewsAndPublications/RegularPublications/Pages/heb_doch11h.aspx. Accessed 12 June 2014. The Trachtenberg Committee. (2012). The Report by the Committee for Economic Social Change [Hebrew]. Available: http://hidavrut.gov.il/sites/default/files/%20%D7%A1%D7%95%D7%A4%D7%99.pdf. Accessed 5 April 2015. Yossef, R., & Spivak, A. (2006). Another Economic Policy: The Pension—Where? [Hebrew]. Van Leer. Available: http://www.vanleer.org.il/sites/files/product-pdf/may2006.pdf. Accessed 15 March 2015. Zilberman, S., Hachmon, A., Kahn, M., & Gur-Gershgoren, G. (2012). The Crisis Of Corporate Bonds In Israel and The Risk Pricing In The Primary And The Secondary Market 2008-2010 [Hebrew]. Israel Securities Authorities (Working paper). Available: http://www.google.co.il/url?sa=t&rct=j&q=&esrc=s&source=web&cd=6&ved=0CDsQFjAF&url=http%3A%2F%2Fwww.isa.gov.il%2FDownload%2FIsaFile_8080.pdf&ei=l63lVN-CIIjxaN_3gsAC&usg=AFQjCNHHT9KJzaXH3z82vRXnrIX9uul31Q&sig2=gbpweauDJBUBQJOsPlcgTA. Accessed 16 March 2014.